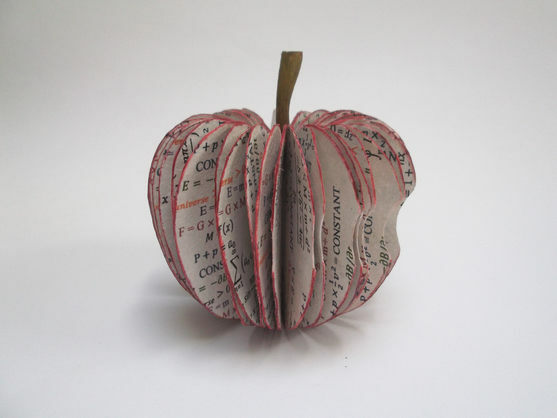 In her own work, Susan delights in the interplay between form and content, the accidental imagery of paste paper painting, and the pleasures of discovery in paper engineering. 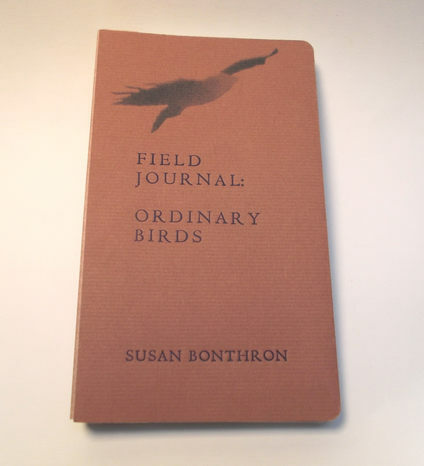 The subjects of her work include the natural world, poetry, the intersection of myth and science, and change over time. 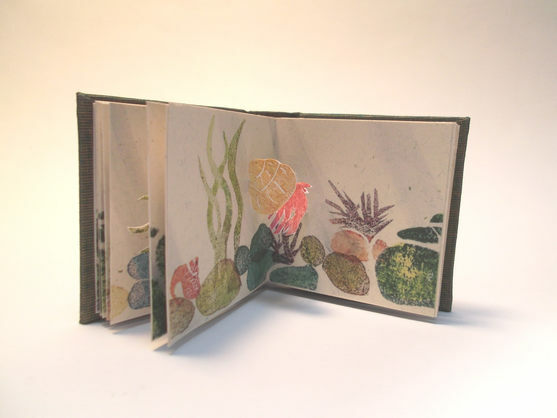 She enjoys investigating and incorporating found materials such as mica, stone, dried plants, shells and other natural objects in her books. 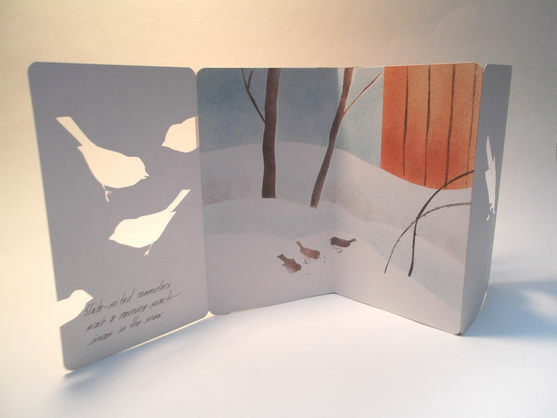 Pochoir, handwriting, hand-carved stamping, pen and ink, gouache, watercolor, inkjet printing and hot foil stamping are some of the techniques she employs. 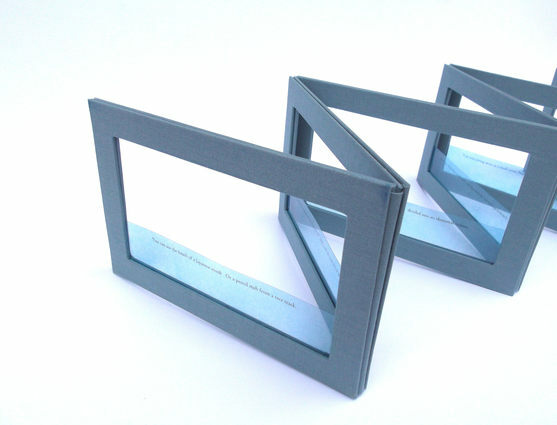 In the international juried exhibition entitled “Infinite Possibilities: Math, Science and the Book Arts” at 23 Sandy Gallery, Portland, OR, December, 2012. Materials: Hahnemuhle bugra over cardstock, foil-stamped title on mica, handwriting on line-printed parchment, enclosures in mica windows. 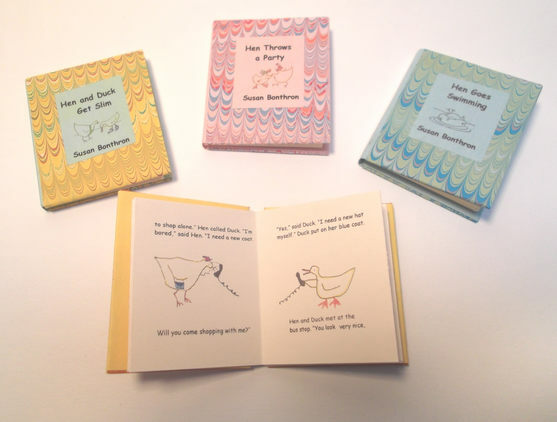 Materials: Paper marbled by artist, accordion with inkjet printed text and drawings by the artist, original stories about the friendship of Hen and Duck. 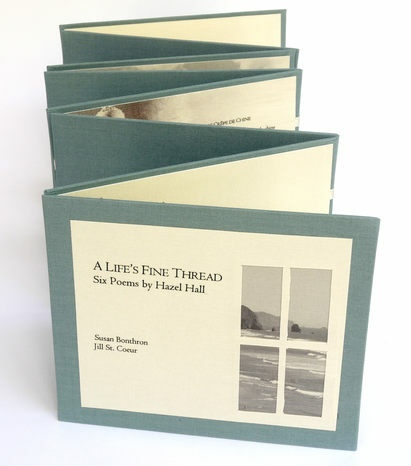 Materials: Book cloth covered frames, poem inkjet-printed on acetate pounced with blue ink, watercolor painting, foil-stamped title, enclosed in drop-spine box with magnetic closure. 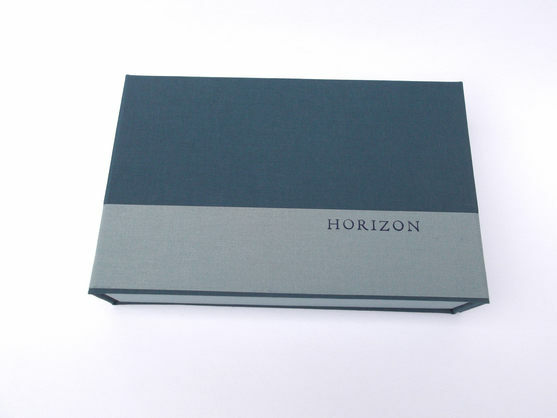 Part of the Guild of Book Workers traveling exhibition entitled “Horizon” through 2014. 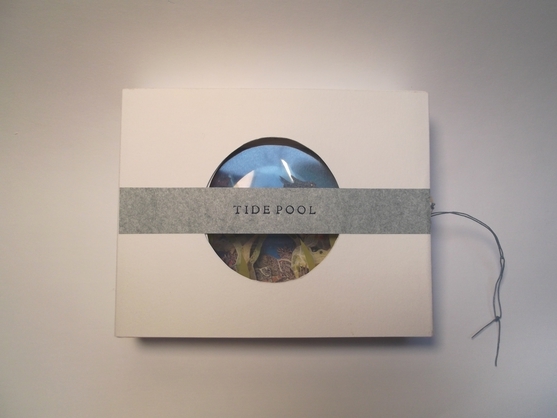 Materials: Duo Barley book cloth over board, hand-carved prints on cardstock, inkjet printed text, foil-stamped title, drumleaf binding; text is a poem called “Tide Pool” written by the artist. 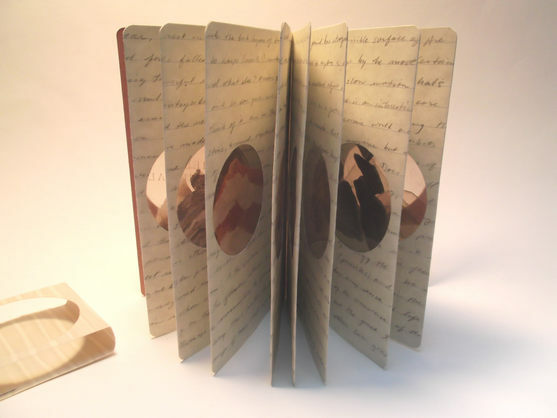 These books — quarter- and half-bound with goat leather — were made at the Center for Book Arts in NYC. Click on a small image for full, larger view and information. 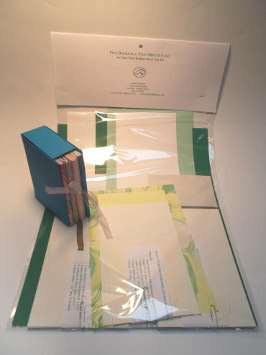 Bookbinding kits include all materials and printed, illustrated instructions. Age recommendations/experience levels vary as indicated. 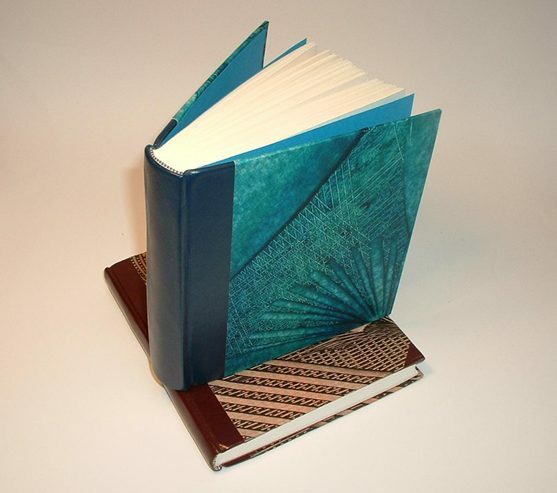 All kits also include a 10% discount on a class at Otter Pond Bindery. Kits may also include additional items as noted. Email me at susan.bonthron@gmail.com for prices, to order, and to find out about additional kits. 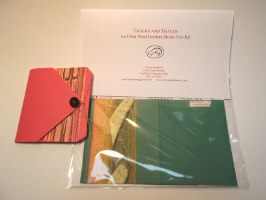 Simple bookbinding toolkits are also available. 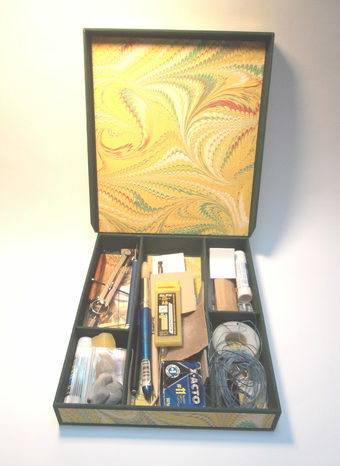 They include a needle tool, bone folder, needle & thread, cardboard sewing cradle and cutting mat, acid-free permanent glue stick, clips and a Davey board 45° angle ruler—everything needed (except scissors) to complete the book kit projects. 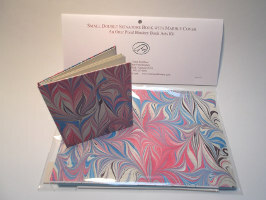 Contains Otter Pond Bindery marbled paper, text paper, colored paper, marbled spine and cardstock covers. 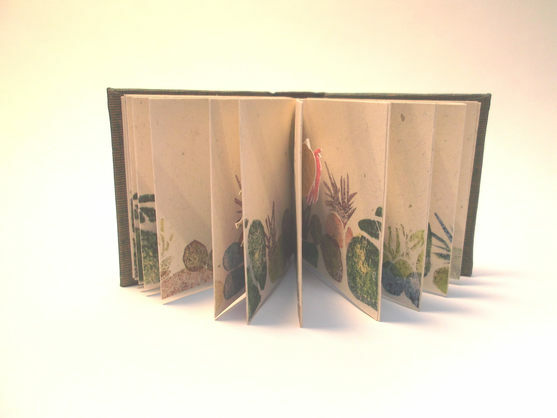 Finished book is 3" x 4.5" x .25". Age 10 and up. All skill levels. 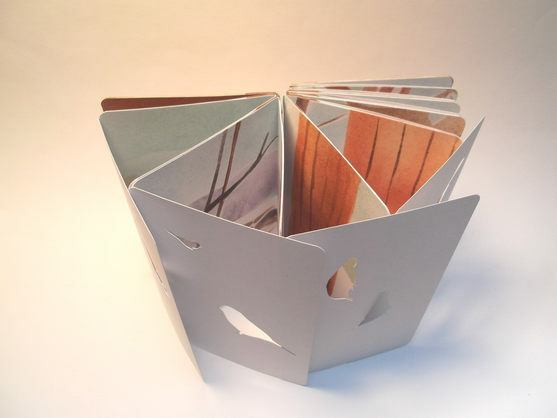 Kit includes all parts necessary to make five different book forms that fit in a paper case. Materials for each book are clearly labeled. 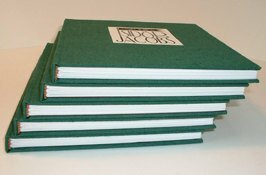 Finished size of case with five books is 4.125"w x 5"h x 1.5"d. Ages 15 and up. 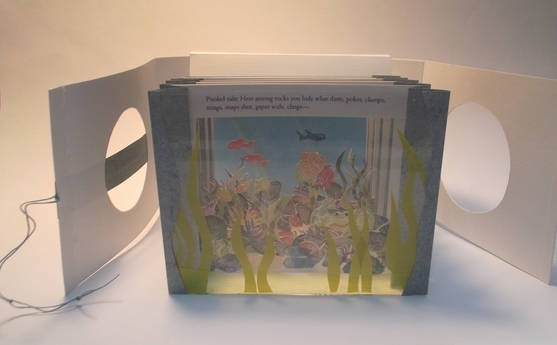 Some book arts experience/skill highly recommended. 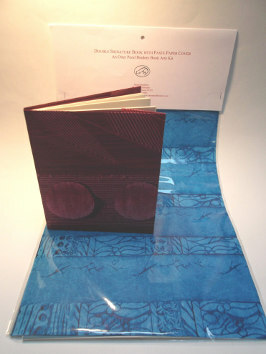 Kit includes Otter Pond Bindery paste paper, 16 pp text paper, cardstock inner cover, thread. Finished book measures 6.5" x 7.75" x .25". Ages 12 and up. All skill levels. 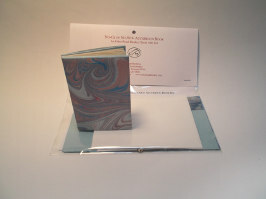 Kit includes Otter Pond Bindery marbled paper, text paper, cardstock inner cover, thread. Age 12 and up. Some experience helpful. 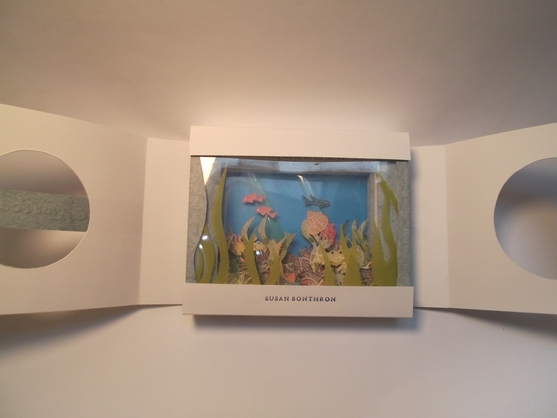 Finished book measures 4" x 4.75" x ~ .25"
This kit includes a paste paper-decorated cardstock cover with ready-to stick pockets, button, thread, text pages, plus four-inch and ten-centimeter ready-to-stick-on paper rulers, and an animal tracks ID card for animals in the Northeast. 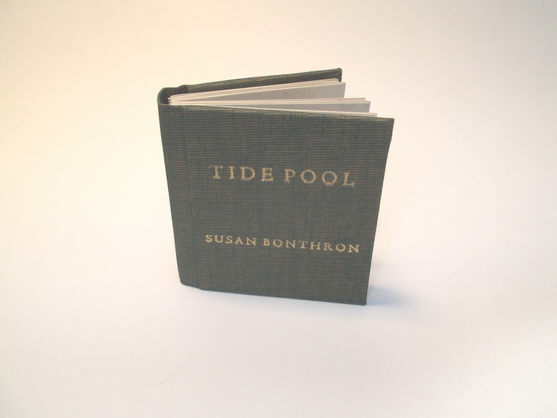 * Finished book measures 4" x 4.5". Age 8 and up. All skill levels. This kit is designed to encourage kids to have fun discovering animal visitors in their own back yards. *Many other ID cards are available, including winter twigs, leaves, seashells, aquatic invertebrates, ferns, raptors, etc. from Libby Davidson, www.starflowerstudio.com in Colchester, VT.
Special commissions often focus on preserving family memories — from a twenty-volume edition of a personal memoir to unique, hand-bound wedding guest books and photo albums. High-quality materials and craftsmanship distinguish Susan's work and her open, friendly, and creative style insures that what you want is clearly understood and that her design will best suit your needs. 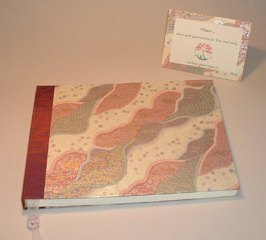 Asahi book cloth, Yuzen Shi silkscreened paper, binder's board, text paper, gauze ribbon, and mother of pearl button. 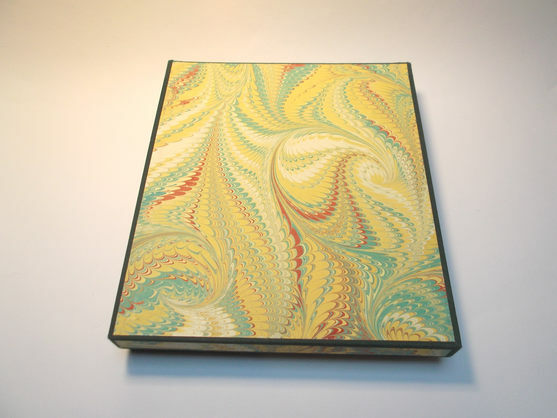 Susan makes wedding albums like this one on commission. 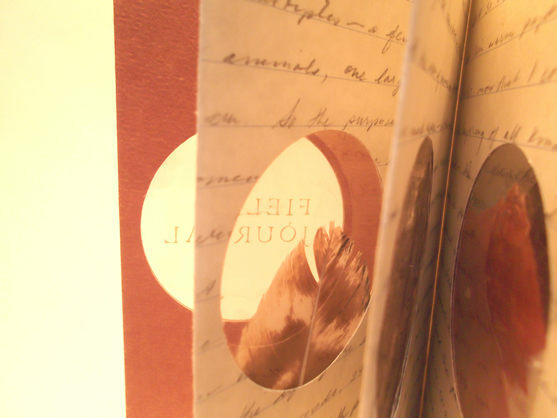 It features two sections at the beginning to be used as a guest register; the following four sections contain stubs to allow for expansion to hold photographs. 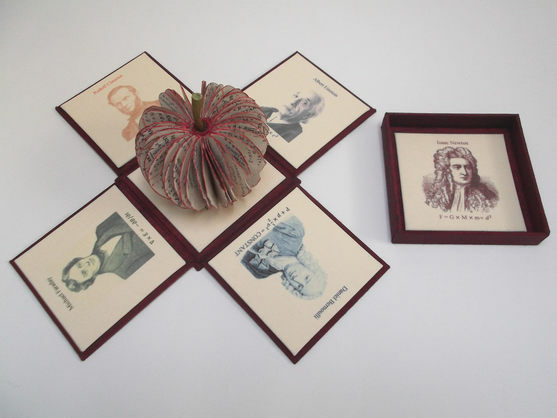 It was a complete pleasure working with Susan on a 20-volume hand-bound edition of The Mental Portrait Album adapted from one my great-grandfather had in the 1890s. 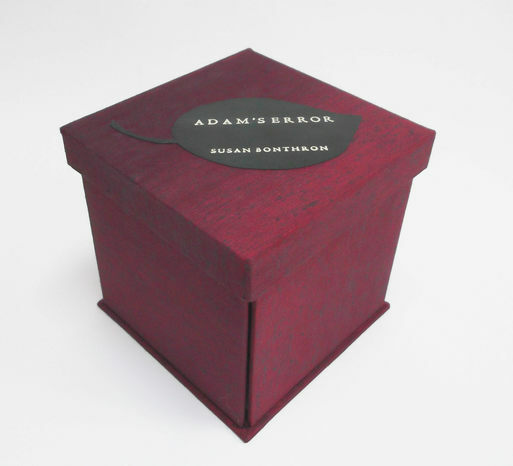 She overcame several challenges with the format, created a beautiful product and cared about results as much as I did. 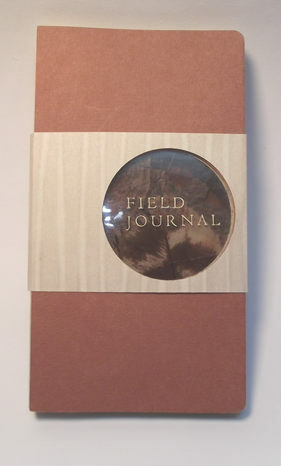 Canapetta book cloth, binder's board, printed stories.